Heat oven to 350°F. Spray 12-inch round pizza pan with cooking spray; sprinkle with cornmeal. In medium bowl, stir Bisquick mix, Italian seasoning, hot water and oil until soft dough forms. Place on surface lightly sprinkled with additional Bisquick mix; knead until smooth. Press dough in pizza pan. Bake 10 minutes. Spread pesto over warm crust. 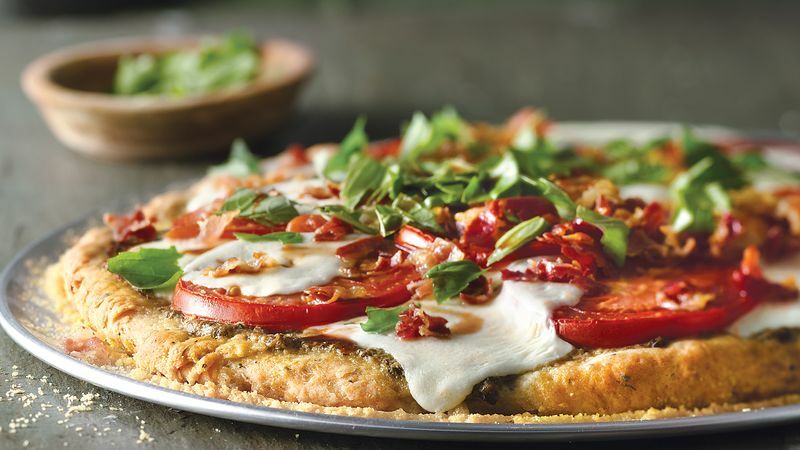 Arrange tomatoes and mozzarella in circle on top of pesto, overlapping tomato and cheese slices. Bake 15 to 20 minutes longer or until crust is golden brown and cheese is melted. Sprinkle with pancetta and basil. Drizzle with balsamic vinegar. Sprinkling the pizza pan with cornmeal after spraying adds to the crispness of the crust. Pancetta is a cured pork much like bacon with its layers of pink meat and white fat, but it is dried and not smoked. It often comes in a sausage-like roll and is purchased thinly sliced. It may also be made as a slab, which is usually chopped or diced. If you can't find pancetta, bacon makes a good substitute.